When I was little Mom would tuck me in each night and ask if today was a happy day. Well, today was a happy day. Well, if she asked me that today I would sure say “Yes it was”. For starters, in case you didn’t notice yesterday I didn’t post any pictures. That is because my photo froze up. Well, this morning I got up and after the battery ran down and I plugged it in to charge it went back to working right. Then we got great news from our mechanic. 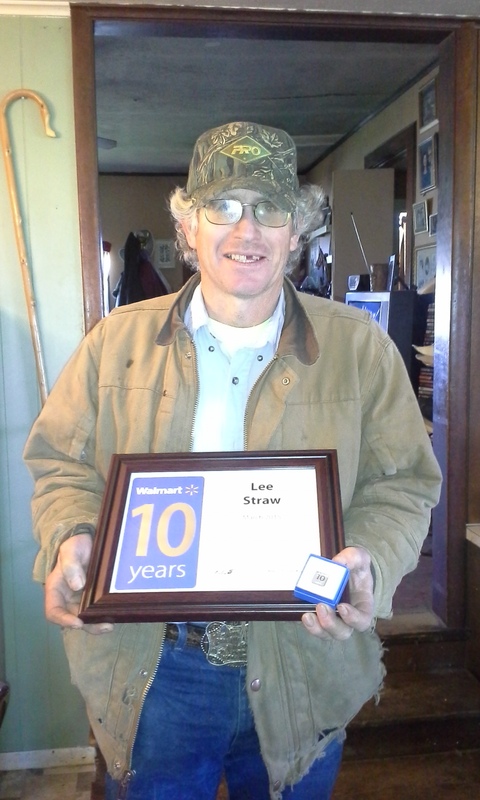 The wonderful guy he is fixed our truck cheaper and quicker then he quoted to us. By about 2 hours and 80 bucks!! 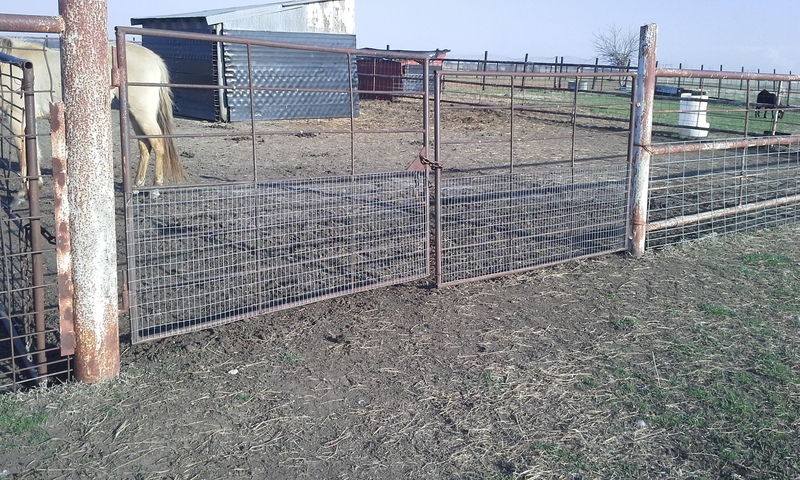 Then here are some of the things Mom got done … The horse gates are now covered to keep babies out from under horse hooves. 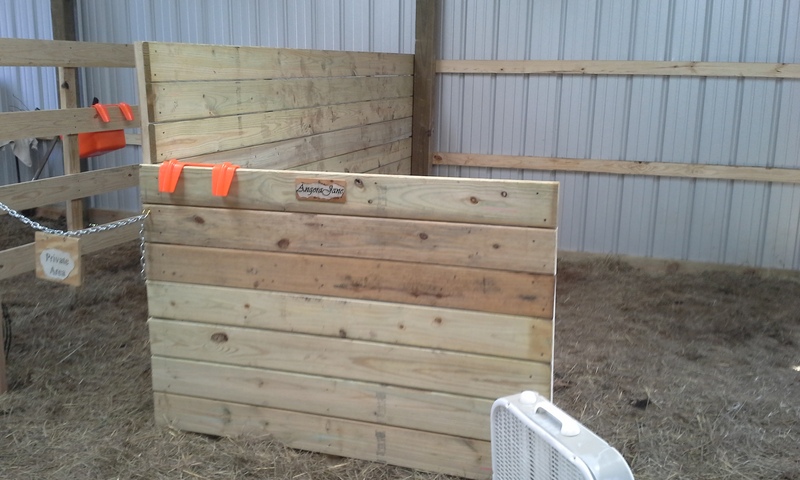 Then since the fence is now cut and getting ready to be removed Mom took down the wire and put in the two panels that will now open the barn up to the goat pen. 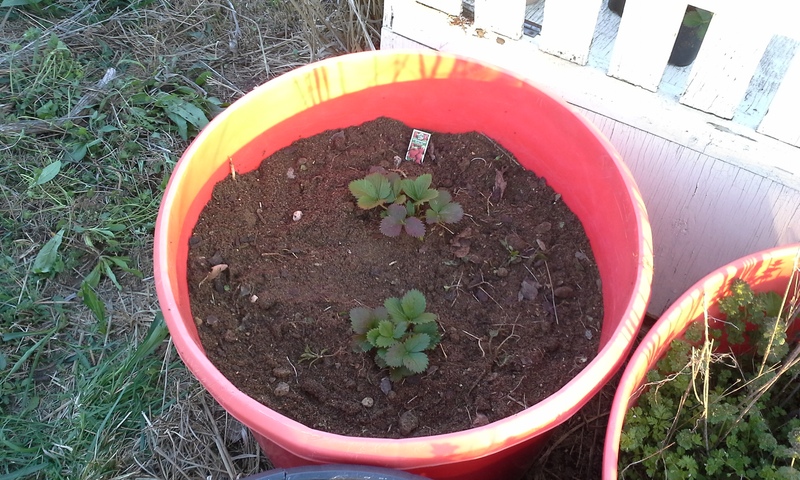 Then to make it a perfect day, Mom planted my some Strawberries!! Today started out well enough but I have to admit that watching a two year old experience a ewe giving birth was kind of funny yet a bit unnerving … He was horrified by what that ewe “Pooped” out and for some reason my super powers were suspended as I couldn’t move fast enough to please little man in the care of Sally. 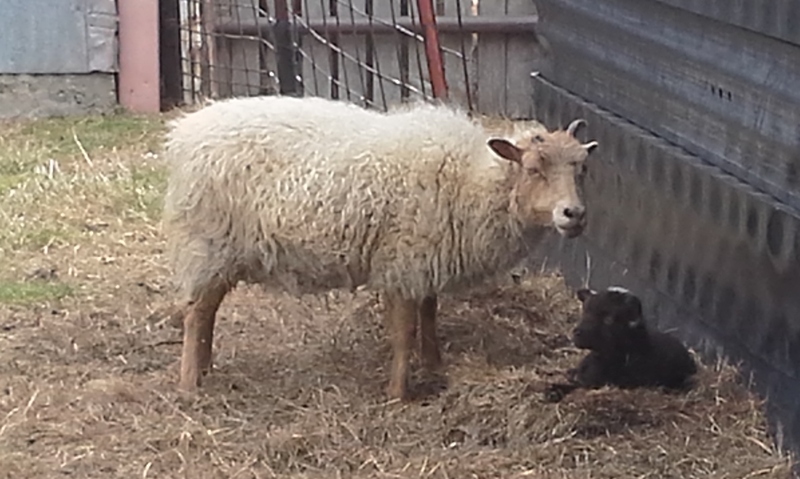 You guessed it, Sally gave birth and it is a girl that has been dubbed Aurora. Since it was a single birth we normally let nature take it’s course. With her being a first time Mom, we do keep a close eye on her though. Okay, that is normally. Now enter a two year old. Let me just start by saying that anytime he falls or hurts himself Mom tells him “There’s no blood, You are fine.” Now I am sure all of you know that a birth does NOT happen without blood. I couldn’t imagine that seeing a birth would changed that wild little Man but it did. We had already bottle fed the babies as him and I do every morning. He loves to feed Duke but won’t feed Scamp. He says Scamp is Mine and Duke is his. I don’t mind and Little man takes his chores very serious. After we bottle feed he works his goat. You see he is going to show Van at the county fair so each day he is here he walks him, brushes him and feeds him. As we were finishing up and getting Van his feed, Sally decided it was time to spit out a little darling. Every other time little man has just helped get them to the barn and he never really sees anything but Momma and cleaned up Babies. Not so today … He got an eye full. To me it was funny but he was so serious when he pointed to the Baby and called her Poop. Mom said “Nope that is a baby.” Little man stayed right with Sally with a look of distress on his face that I couldn’t stop giggling at. To help ease his mind Mom put him into action. The minute he thought he was helping he was straight laced and got to work. He was very upset with me when it took me a bit to throw the electrical cord over the rafter to get the baby a lamp. I don’t think I have ever felt so bad in my life for missing a couple of times before getting it hung. I tell you that little guy brought all kinds of hay into the stall and even cheered the baby on everytime she stood up. The words “come on baby, come one” was heard every few minutes. He even threw a fit saying the baby was cold and while we normally let single babies be cleaned by their Moms I had no choice but to rub and dry the little thing just to keep the peace. Little man even shared his animals crackers with Sally. However, everything changed from calm and confussion to screaming panic when it came time for Sally to pass the after birth … at that point Little man was having none of it. In his mind Blood means someone is hurt and in this case Little man thought it was Sally. And I tell you there was no changing his mind on that matter … LOL Somehow I got the feeling I let Little Man down and that today, at least in his eyes, he lost a little respect for me. Mom got him calm after they left the barn. However, he came back a million times today to check on the baby and her while Dad and I had to bury the after birth so he couldn’t see it. 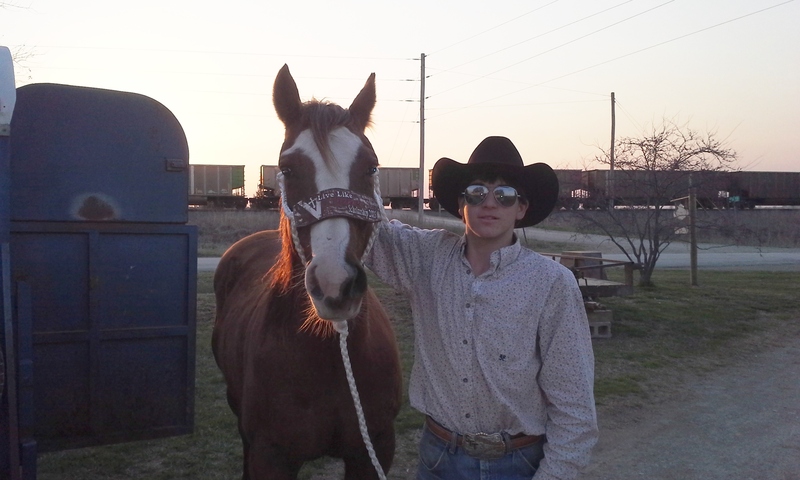 So today I had a college Scholarship roping so I took a day off from the farm and went Roping. I did pretty good and even won second. 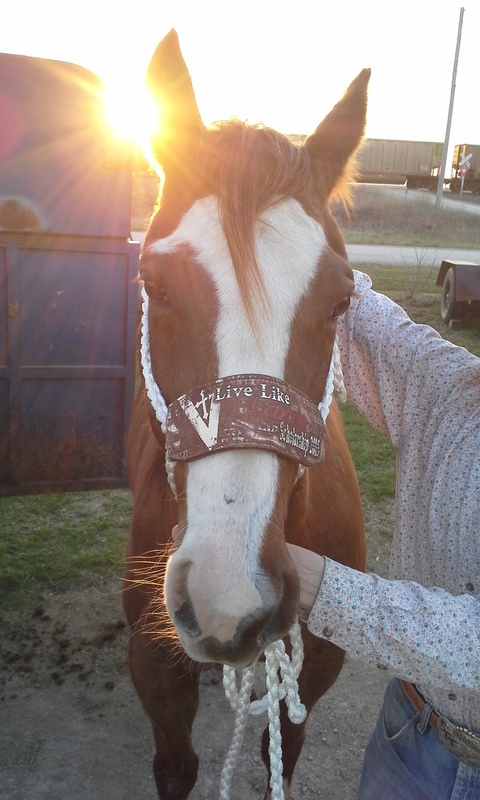 I won a new halter and a paycheck. And to top that off the college now knows my name so maybe there will be other scholarships to be had? 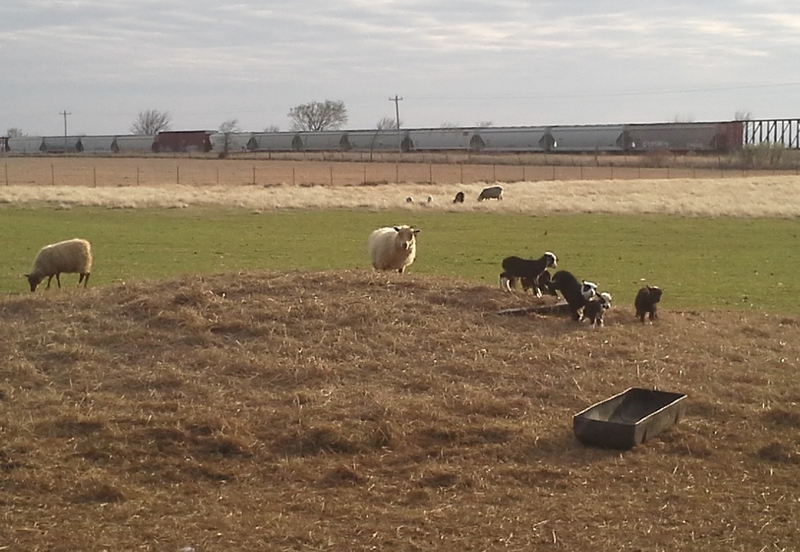 While I was gone, I left Mom in charge of the shepherd duties for the day … Oh what fun Mom had. Here is the stories I got on the phone and when I got home. I will try to tell them as accurate as I can. After that she was to bottle feed the two babies. 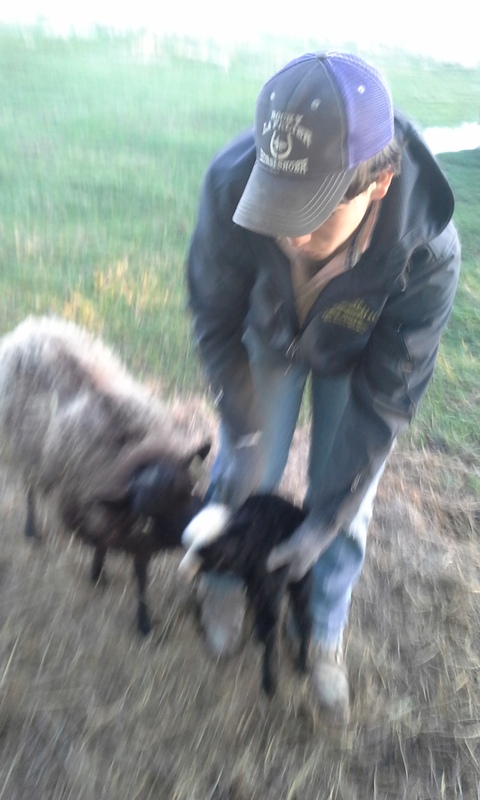 At that same time she was to let Petunia and her twins out of the barn. Okay, so from what I heard, things didn’t go as planned after that. 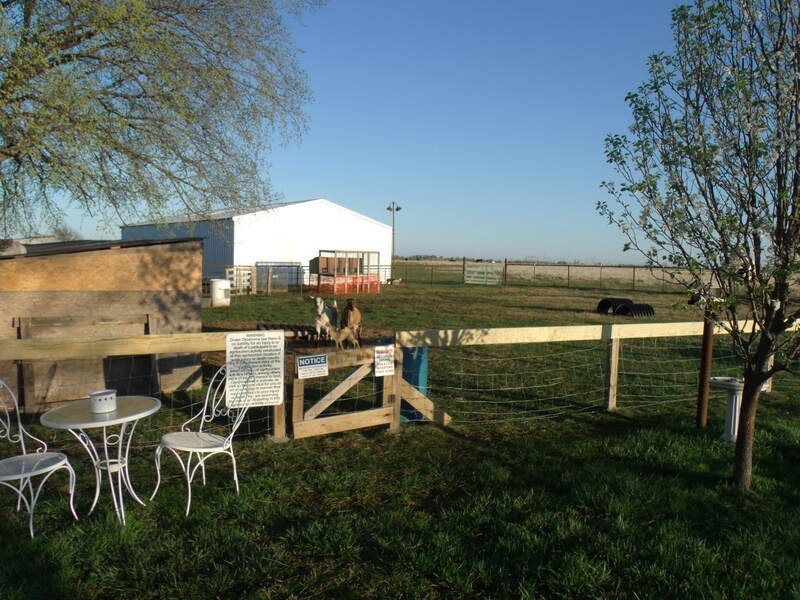 You see Mom got the bright idea that since Yuchi had been doing so well and was eating and getting up on her own, that it was time that she be let out of the barn to enjoy the sun. Okay, I agree with that. However, from the phone call I got, I gather that Twix wasn’t happy about being the only one left in the barn. Twix took it upon herself to brake out before Mom caught on. Mom was busy working on a few things around the house. She mowed the yard and gave the goat shed a tune up. She was going to give it a fresh coat of paint as well but she said it was cloudy and she didn’t want it rained on before it dried. So instead she decided to clean out the stalls in the new barn. There Mom figured out that Duke really likes feed. She found this out when she tried to pen him and Scamp to keep them out of her way while she worked. Mom says at one point all she could do is stand in the barn and laugh as Duke and Scamp repeatedly got out of the pen faster then she could get them both in through the large wooden divider. Finally, she got them contained and out of the feed. At this point Mom had to turn her attention to Jethro and Hank. They were going crazy outside and not in a good way. Mom rushed from the barn to the front yard to find a man riding on the truck of a car leading a horse down the old Highway. I wouldn’t have believed that story myself but after I got home they drove back by doing the same thing. I think Mom should have let Jethro eat them for doing that. It isn’t safe for the man on the truck or the horse. Crazy people. 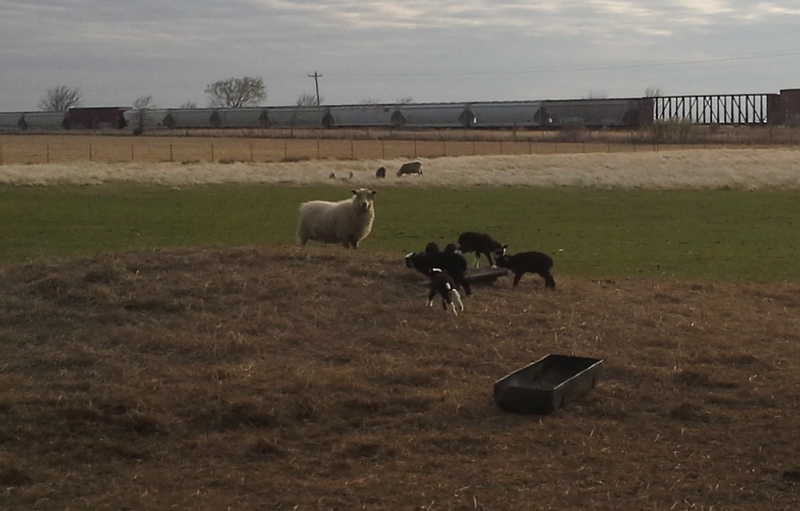 And let us not forget she also had to make regular pasture checks as we still have two ewes that should be breed. 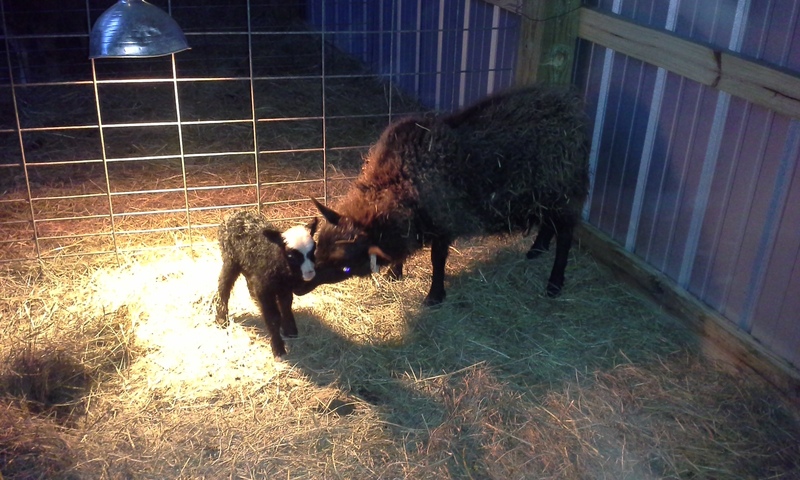 On several of those pasture checks Mom found about 5 baby Shetlands in the horse stalls. The problem with that is that Storm was not liking it and she was getting upset. If they keep getting in there Mom is afraid she might hurt them. So she spent more the a few times getting them all out. One of the Ewes even had her horn bleeding. I don’t know if she had to get after the horse or not but it can’t be good so I will give her a shot of vitamin to help build her up. 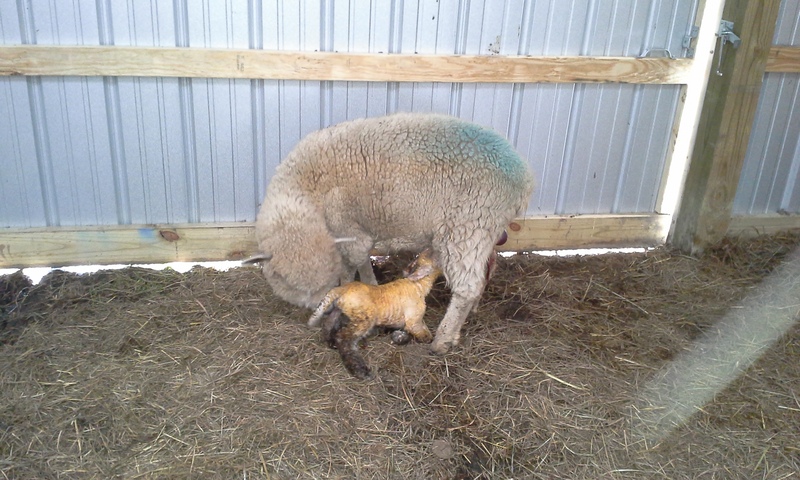 After all she is nursing a lamb and now has some blood loss so I am sure she could use a boost. Mom says that tomorrow we will be putting up some welded wire over the bottom of the gates to keep the sheep out of the horse stalls. 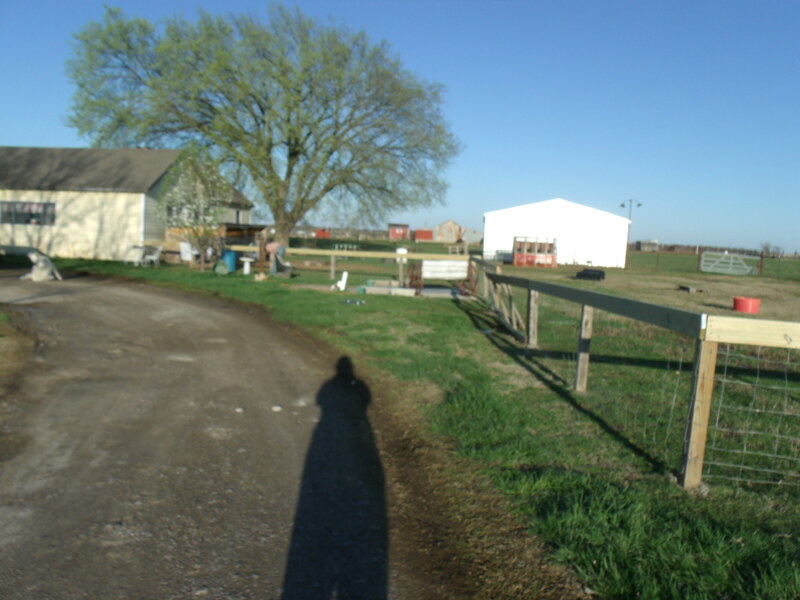 After the barn was cleaned out Mom came in and made the “Private Area” Signs that we need for the new tack room and new feed room and the equipment pen gates. I think they look great. When she got done with the signs she took some time to play by redoing a stool with some fabric. I think it looks better then the signs but don’t tell her that. When Dad and I got home we took pity on her and went and got tacos for dinner from town. Today we sent the day working again. There is something about spring that gets Mom out and working on the farm. However, why she has to drag me and Dad along with her is besides me … LOL! She started by making us pancakes for a bribe … I mean for breakfast … LOL! After we got a full stomach, Mom sent Dad and I to swap out some wood at the lumber yard and get some gas for the tractor and lawnmower. While we were gone Mom planted some seeds and weeded the Cactus beds. When we got home she put us to work too. At some point while loading the trash I tried to snap a picture for you all. 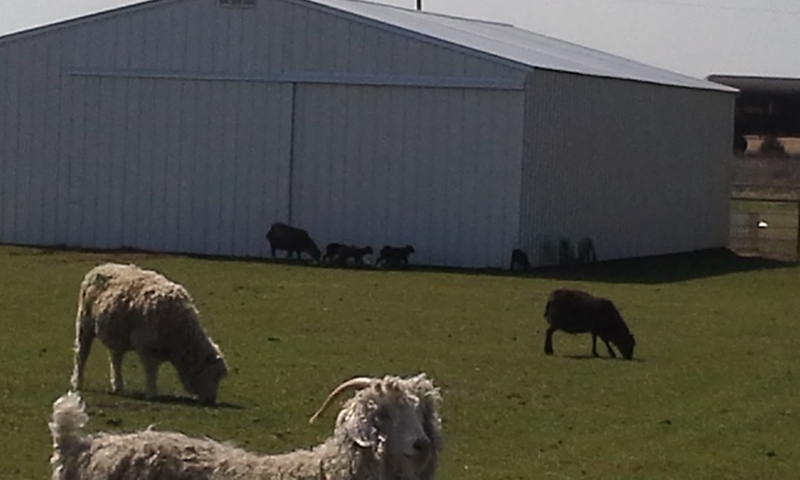 You see the black sea of lambs by the barn???? Jethro is under and in the middle of it. It was pretty funny to see those little booger bouncing off him as he lay there sleeping. Anyway, while Dad and I hauled the trash Mom stayed home and got to work with the wood we had just exchanged. She has everything but the walls to the shop done and she has gotten to the point of installing the stalls … She got this one up but will have to wait for the lambs to be let out of the barn tomorrow before she can put anymore up. 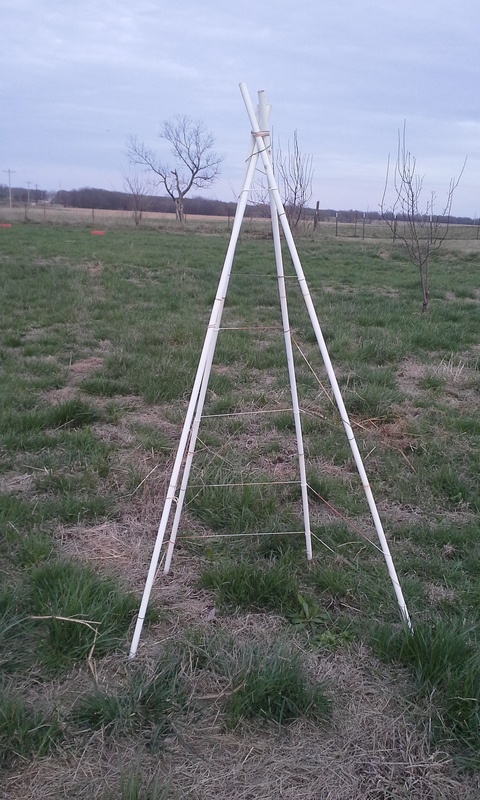 This is the divider that will keep the bales of hay out of our tack. When we got home Dad and I went to the roping pen. I have a big roping tomorrow and am trying to get all the practice in I can. 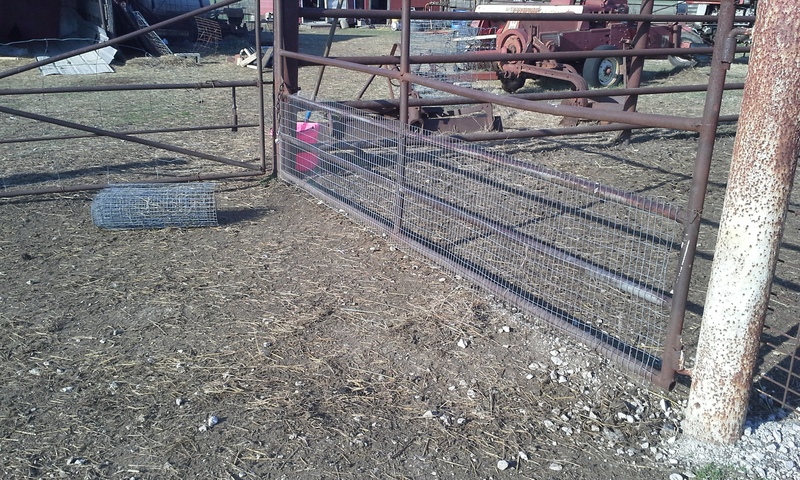 After I got done I finished up the second feeders that I have made in the last two days. 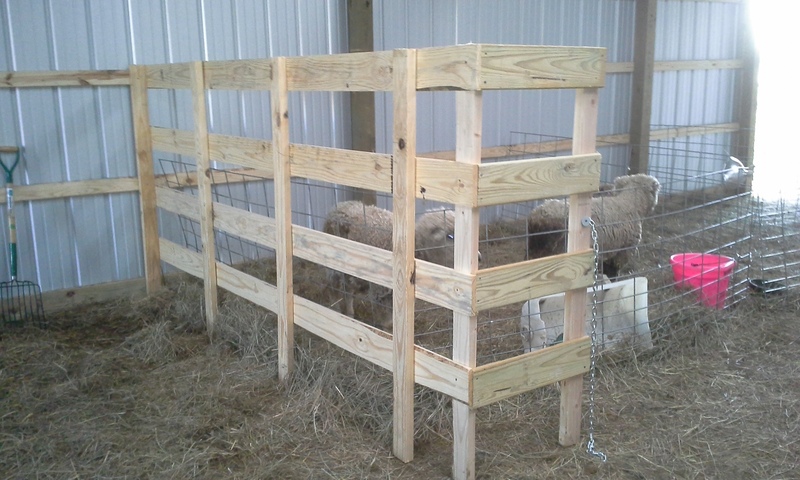 I made one yesterday for the sheep on the pasture and today I made this one for the goat pen. 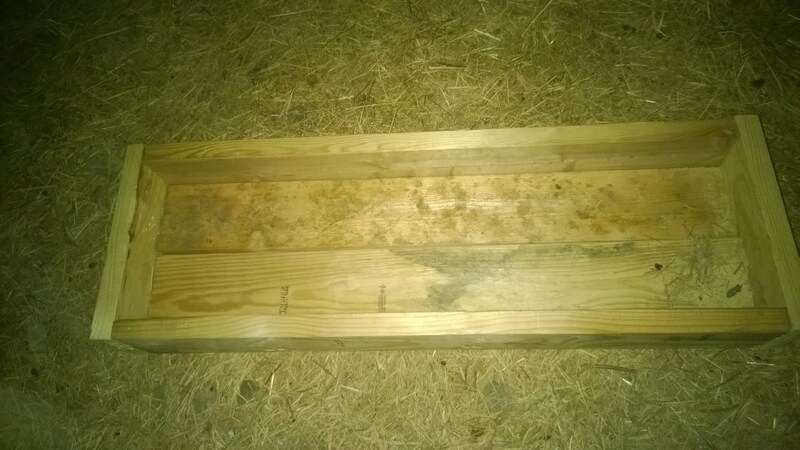 Mom also made a small on from scraps of wood in the new barn as well. Her’s is shorter and for use in the sheep stalls. Why is it that Spring the time for getting things done and cleaning? If it doesn’t for you, let me tell you it does for Mom. That means she has use working on all the little things we couldn’t get done because of winter. However, Today Petunia decided to turn Mom’s day upside down and show her who as really in charge around here. 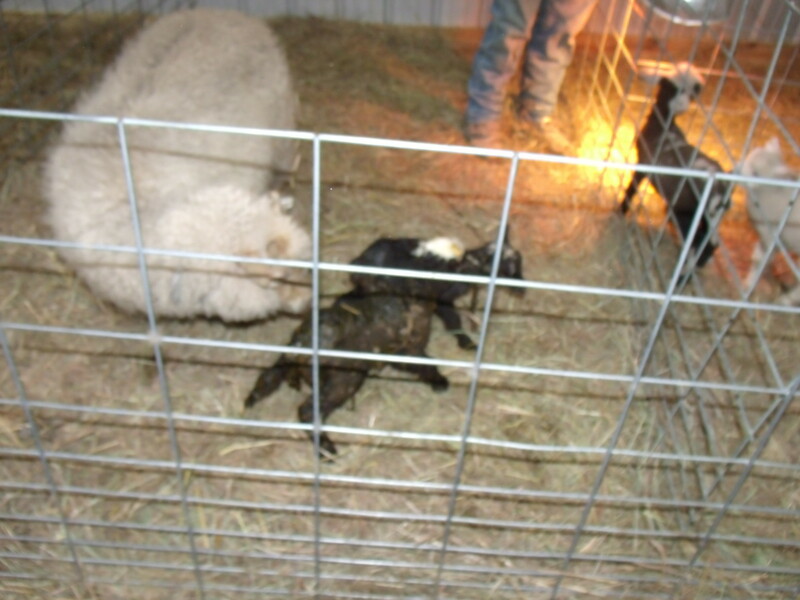 With that in mind we started our day getting Petunia and her new twins in the barn. Thanks to Shea on Facebook they are now named Bambi and Feline! After that I did chores and then started creating. 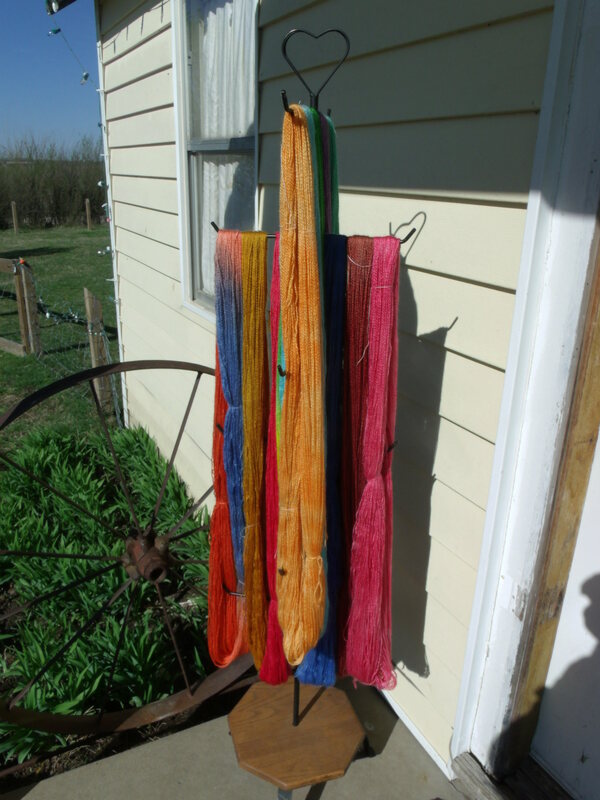 I am making more feeders. 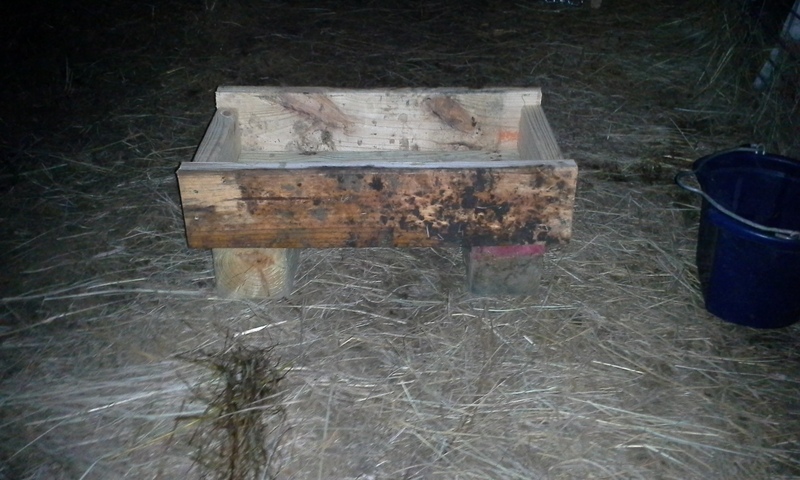 The great thing is that I am using the wood the builders left behind from making the barn. 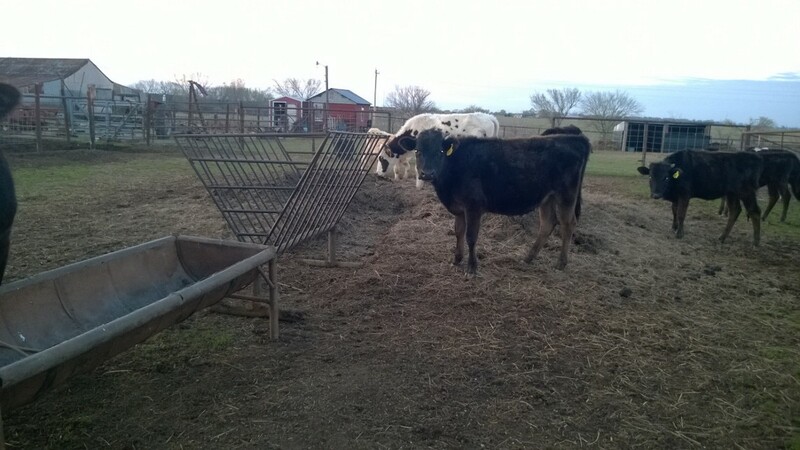 I got one feeder half done before Dad got up and I went to the roping pen. Mom however, spend this time in the house at her sewing machine. She was figuring out how to make a Peek-a-Boo bag with a Zipper closure. 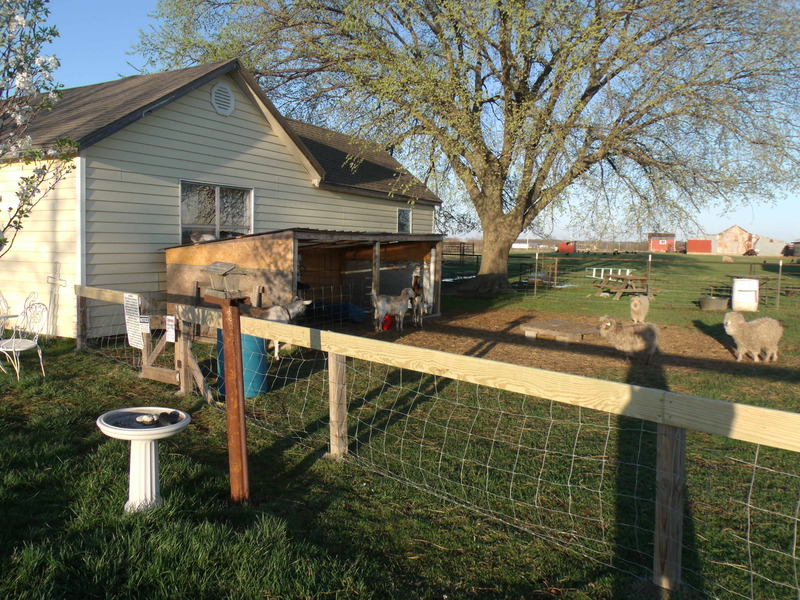 After Dad headed to work for his last night this week, Mom had herself and I outside finishing putting up the top rail on the yard pen. I am happy to say the top rail is done and the North side of the house even has the staples put in to hold the woven wire in place. We are waiting for the south side of the house to set up before we put the staples in. After that all we will have to do is the bottom rails but that will require money and that means waiting and saving. The good news is that Holly can no longer jump out of the pen so she no longer needs her cement block to be chained to … This is a big plus as Mom hated that we couldn’t keep her in any other way. After we got that done I went back to work on my feeder and got it done. I didn’t get any pictures taken though. Mom headed to the garden to make her Teepee. She will plant cucumbers on it and then kids can sit inside it kind of like a hide out. I did get a bit distracted from my work day though … Check this out … Sproung is starting up around here and it is funny to see the new Mom’s on Babysitting duty. The new Mom’s try to keep up with the kids the older ladies just lay down and watch them. Then they just call them back from time to time. The new Mom’s are much more fun to watch though. Today there wasn’t anyone big thing that went on. There were however, alot of this and that and most of that was work! All of it was good though. I started my day with chores and the normal routine. 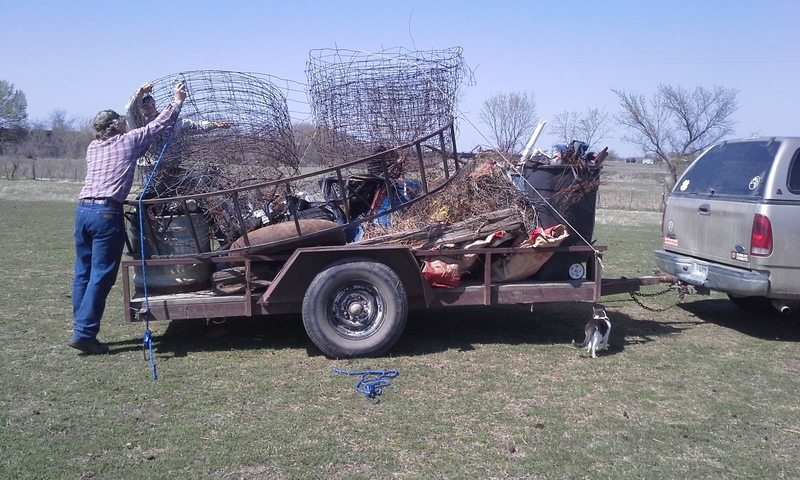 When Dad got up, he and I worked to move and clean a few feeders out. I move This one to the pasture so there will be more room for all the sheep to eat. 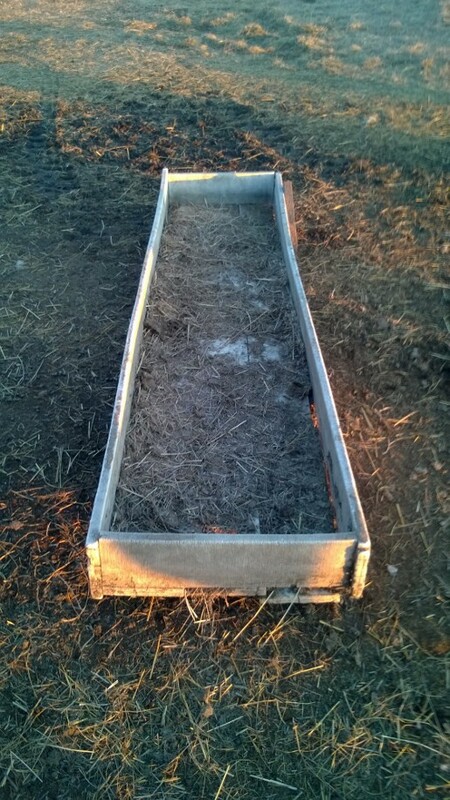 While I was at it I cleaned out the Cattle hay feeder and moved it. 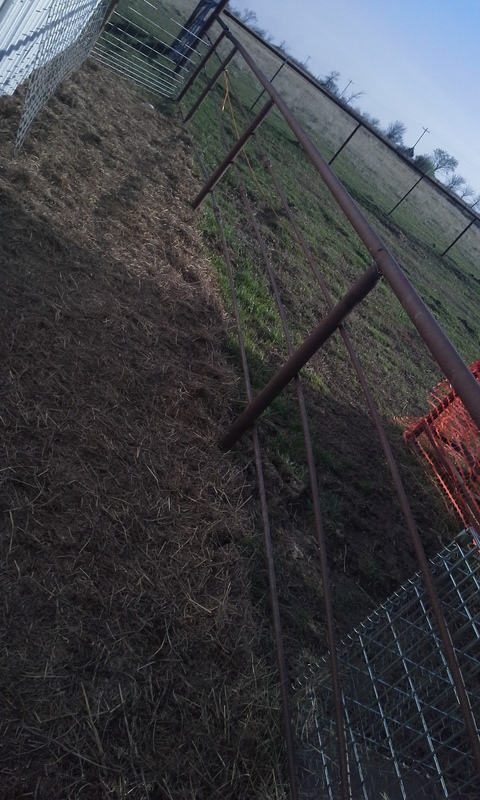 I still have to finish with the hay pile but after that this pen will be done and spring cleaned! Anyway, After Dad left we headed to town to pick up some boards. 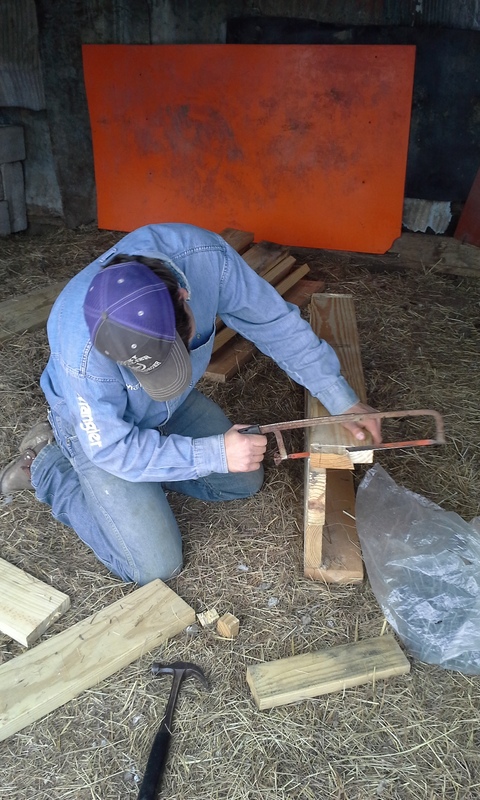 You see we made the yard pens last year and we started using them with Mom saying they weren’t finished. Well, today we took one more step to getting them done. 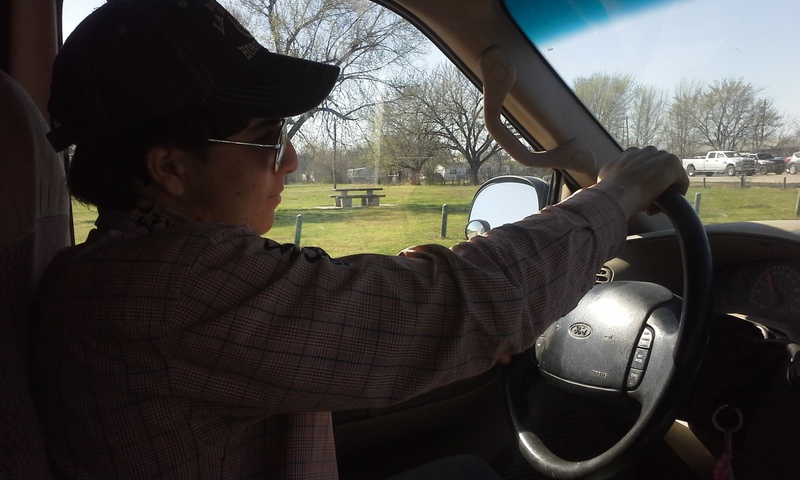 At the lumber yard Mom tricked me and I ended up driving home from town for the first time. I don’t like driving in town or on the highway so I never do. Our Gravel roads I am comfortable with but Mom says it is time for me to start driving real roads … LOL … I think Mom enjoyed being the passenger to much if you ask me! 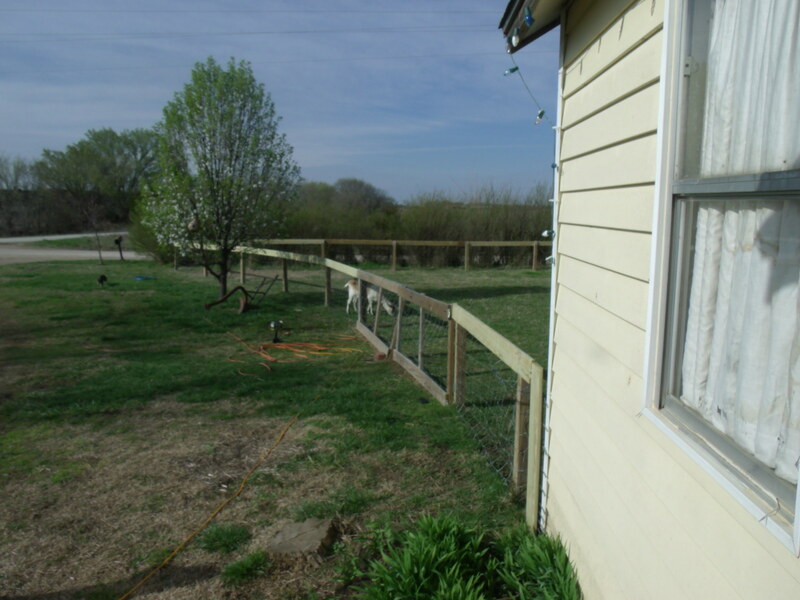 Once we got home Mom and I put the top rail on the yard pen the goats are in. I have to admit the rail makes so much difference. I am one of those people who has a hard time picturing things in my mind. 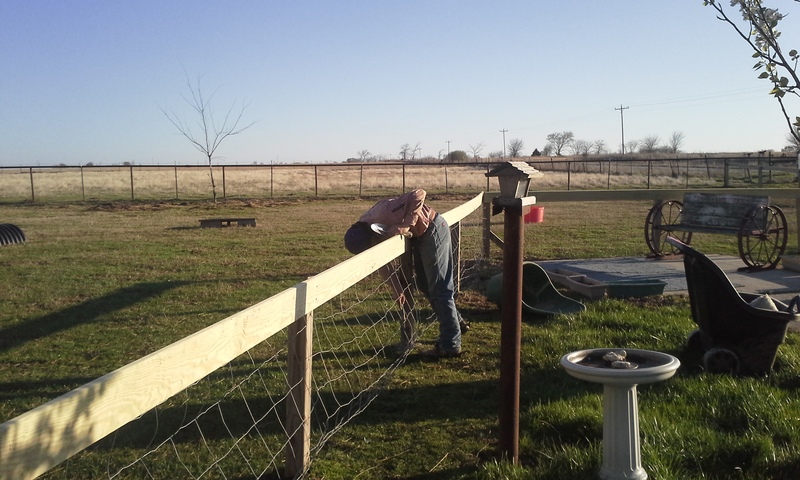 Mom kept telling me that the pen wasn’t done but I just saw crooked posts and stretched out woven wire from the Goats “trying” the fence all the time. 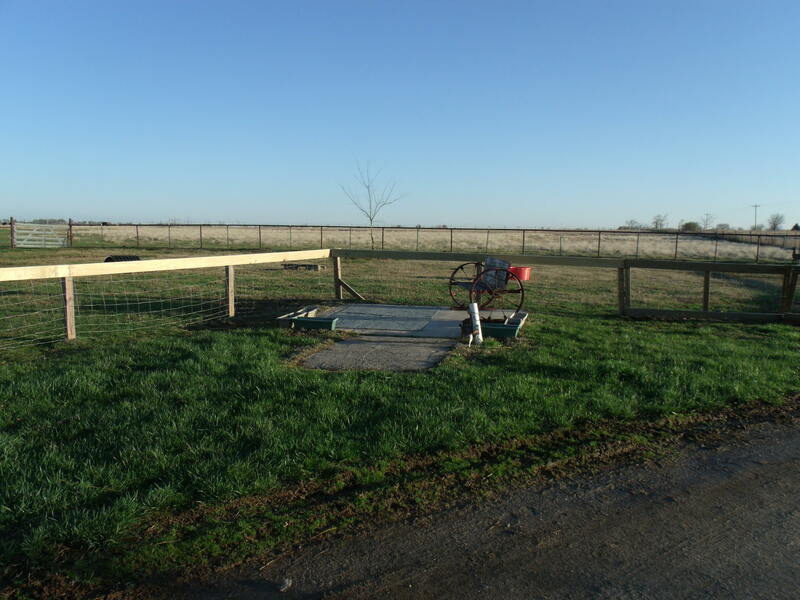 However, today we not only put on the top rail but we set the posts with concrete. Those two little things made our pen look so much better. Not to mention that now Holly can’t jump out of it. I know we have to do things a little at a time because we aren’t rich. I get that. I just wish sometimes I could see what Mom sees in her head when she starts projects that take longer to complete. We still have the bottem rail to go (that will wait until there is more money to buy the wood) and the gates are not on permanent either. The Gates will be done when they get the rest of their braces and they are straight and when the bottem rail goes in so that we can hang them right. For now they are up simply to keep the goats where they should be. 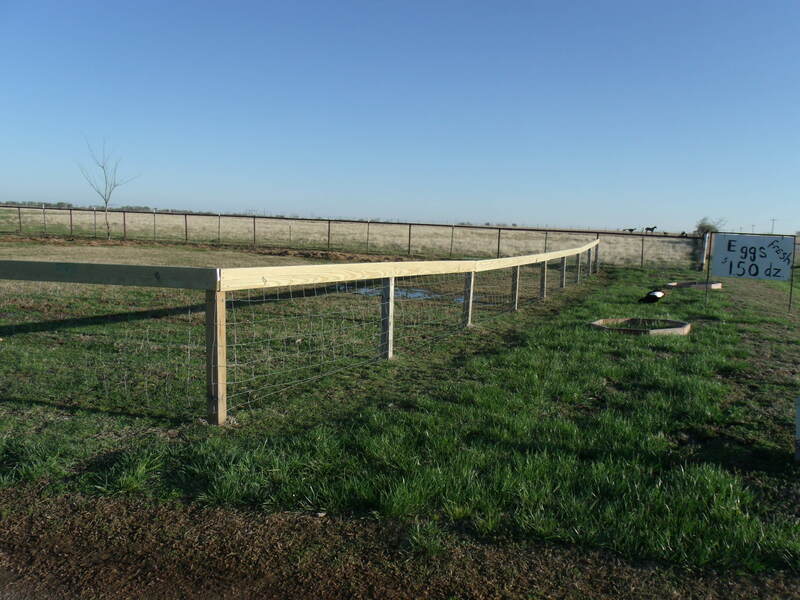 Anyway, here are a few pictures of the pen with the top rail … what do you think?? 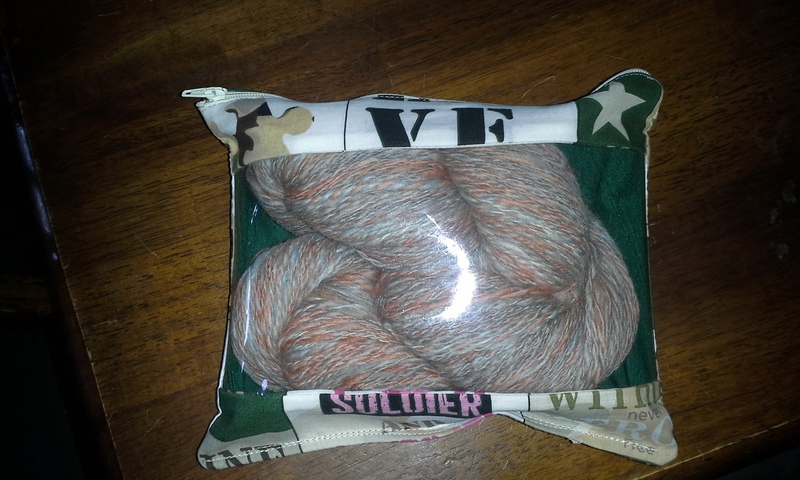 Just think how good it will all look after Mom Mowes the front part. The final thing that happened today is that Paige gave us a little girl that Mitchpoo from Plurk Named Cinderella. I got her moved into the barn and set up in a pen. She will return to the pasture Saturday Morning. That lead Mom and I to do away with some of these social media already … Mom deleted her Pinterest and I closed my Flickr and ustream as I don’t ever use them. Finally we then decided to try a management software but the free version will only allow us to post to three profiles. So we are even thinking of combining the farm and the QT facebook pages as well. Here is my Question to you … what social media do you use? Please Vote so that we can see how everyone keeps up and that way we can use the info to do a better job of keeping you all informed. Mark all that apply to you. Before the storms came rolling in I did fit in some roping. Then Mom and I were off to Art Class. 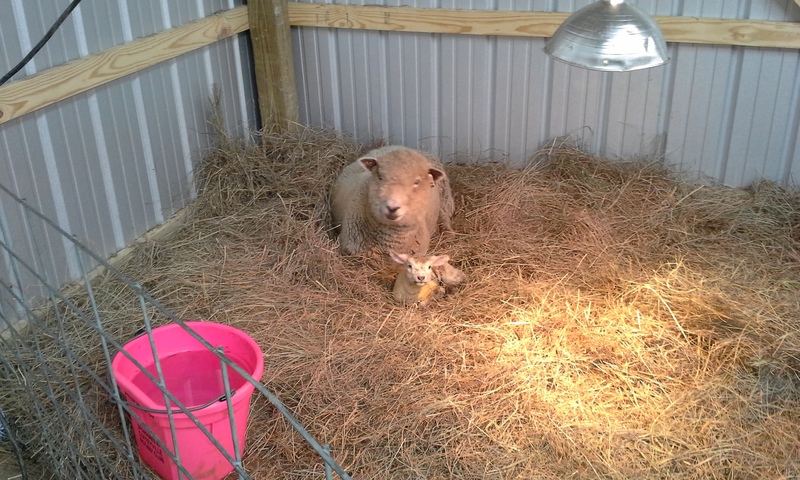 That is okay because as of right now we haven’t had any babies come today … The great thing about today is that tonight when I went into the new barn to feed the Mommas and Ewes in Holding a wonderful thing happened. Because of the babies coming so fast and us not having all the pens up in the barn I had to move Twix and Yuchi into one pen. Neither are 100% so they get along just fine leaving each other alone. Anyway, I dumped Twix’s feed first and before I could get over to Yuchi’s bowl to feed her, she got up on her own and walked to the feed troth to eat with Twix. This is the first time since her Issues that she has gotten to her feet without our help. And this is a step in the right direction. Mom is over joyed to the point of tears. Yuchi is her baby and she is very happy to know she is improving.